President Barack Obama wrapped up his two-day visit to San Francisco with a private fundraiser in the city's Pacific Heights neighborhood Saturday morning. Obama attended a "round table" discussion at the home of Democratic donor and Zynga founder Mark Pincus and his wife, Ali, with about 25 supporters who paid up to $32,400 for the privilege, according to Democratic officials. Air Force One touched down on the tarmac at San Francisco International Airport at 3:32 p.m. Friday. In San Francisco, Obama was met by a group of protesters expressing their disapproval of U.S. foreign policy in Syria right before he attended a DNC fundraising reception at the W Hotel. The event, with musical guest Maxwell, had tickets that started at $500, according to an invitation on the DNC's website. According to the DNC website, the event was sold out. President Barack Obama arrived in the Bay Area Friday afternoon headed to San Francisco, where he will be met by a group of protesters expressing their disapproval of U.S. foreign policy in Syria, prior to his attendance of a Democratic National Committee fundraising reception Friday afternoon. Mark Matthews reports. 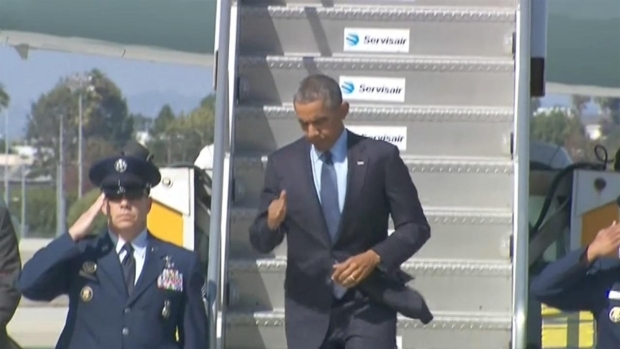 The president flew in from Southern California after attending a DNC reception and dinner in Los Angeles. Obama was in Santa Monica Thursdaytalking to young entrepreneurs about making the Los Angeles area a leader in job creation. Thursday evening, the president will address well-heeled Hollywood types at Gwyneth Paltrow's Brentwood home at a fundraiser for the Democratic National Committee. Tickets start around $1,000 and top out at $32,400, the maximum gift allowed. Before heading north, President Obama declared a large chunk of Southern California's San Gabriel Mountains a national monument. 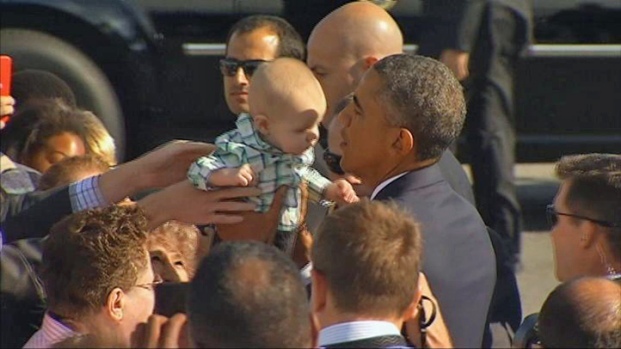 Obama was most recently in the Bay Area in July, also to raise money for fellow Democrats. This coming week brings more of the same for the president, including his long-anticipated, first appearance at a campaign rally this election season. At an event Wednesday in Bridgeport, Connecticut, he'll help boost Gov. Dannel Malloy and state Democrats. Malloy is in a tight re-election race in a state Obama won easily in 2012. Obama has worked hard all year to raise money for Democratic congressional and gubernatorial candidates. But his dismal approval ratings — in the low 40s, according to recent polls — so far have sidelined him from the campaign trail as candidates have avoided appearing with him, especially those from states where Obama lost in past years. But it has been expected that Obama, unpopular or not, would have to step up his involvement in the final weeks before the Nov. 4 elections, in which control of the Senate will be the night's biggest prize. Democrats are currently in charge of the chamber, but Republicans can regain control by picking up just six seats. The political party that controls the White House historically loses seats in Congress in the midterm election of the president's second term, history that hardly favors an incumbent nearing the end of six years in office. Obama has chastised core Democratic constituencies for turning away from politics in nonpresidential election years but also has urged them to snap out of their midterm election slumber and vote next month. "There's a congenital problem that we have as Democrats, and that is, in nonpresidential elections, in midterm elections, we don't vote. We don't vote," he told about 300 supporters at a Democratic National Committee event at the W hotel Friday night. "But the main thing that I need right now is votes. We've got to mobilize. We've got to organize. We've got to knock on doors. We've got to make phone calls," he said. "If young people vote, if women vote, if people of color vote, if people who care about the environment vote, if people who care about LGBT rights vote, that's a majority." Obama returns to the White House on Saturday after spending the past three days in California, mostly for fundraising. He also raised money this week in New York City and Greenwich, Connecticut, and has similar events in the week ahead. On Tuesday, he'll help raise money in the Washington area for Democratic House candidates. President Barack Obama will be in San Francisco Friday for two Democratic National Committee fundraising events that are closed to the press. Nannette Miranda reports. NBC LA contributed to this report.